This quick and easy pasta recipe is a perfect meal for two, or simply double it for a simple family supper. 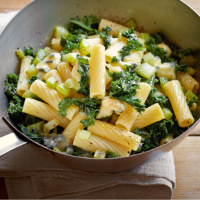 Cook the pasta in boiling salted water for 11 minutes, adding the kale half way through. Drain, reserving 100ml of the cooking liquid. Meanwhile, heat the oil in a small frying pan and fry the celery for 3-4 minutes. Mix into the pasta with the cambazola and reserved cooking liquid and stir until the cheese has melted. Season to taste.